Tristar Epoxy Systems has been in business since May 2016, when the first floor in the first unit in Whistler was handed to its proud and satisfied owner. Epoxy based flooring is the hottest, most fun (take a look) , reliable and easy to maintain style of decorative concrete flooring and has been on the rise all around the world. Originally, the epoxy based technology for floors was used in large scale industrial operations where there was a strong demand for durability. You would typically find them in places such as a plane warehouse. Due to its low maintenance and high durability the epoxy technology started to be applied in smaller scale, more colors were added and now you can use them on a fine surface like your kitchen counter where durability and good looks matter. Metallic epoxy floors look great anywhere you can imagine - showrooms, business entrances, houses, basements and garages. We are here and ready to cater to any of your flooring needs. Tristar Epoxy Systems provides services throughout Whistler, Squamish and Pemberton area. From large scale jobs to small and intricate, we are your guys for any concrete floor decorative needs. 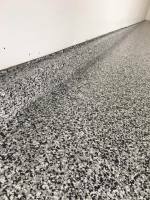 We want to use the latest technologies to ensure maximum efficiency and that is why we chose products of Elite Crete Systems Inc. Their line of epoxy products will last forever, unlike those diluted with water or solvent. The Elite Crete Systems epoxy coatings are made of professionally formulated, 100% solids epoxies, urethanes and polyaspartic resins, engineered to be tough, good looking and non-slip.